Why Jane Austen? Blog Tour with Author Rachel M. Brownstein and a Giveaway! 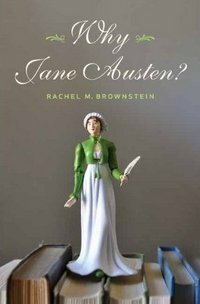 Please join us today in welcoming Austen scholar Prof. Rachel M. Brownstein for the official launch of her book blog tour of Why Jane Austen?, a new literary and cultural history of our Jane’s rise and continued fame that is being released today by Columbia University Press. Jane Austen’s eruption into popular culture in the mid-1990s got me wondering: Why Jane Austen, and not another equally long-dead novelist? What is it about her in particular? When the vogue spilled over into the twenty-first century, and more and more people were proudly calling themselves Janeites, I knew I was onto something. And now, finally, here is my book: Why Jane Austen?, published in June, 2011, by Columbia University Press! The term “Janeite” was coined in the 1890s by the English critic George Saintsbury (he spelled it “Janite”). Picked up by Rudyard Kipling in the 1920s, it has been used in different tones of voice since then. As words do, it has gone through changes over time; and Janeites have also changed. Today they include admirers of Jane Austen’s novels, and of the author because she was a woman or a wit; some are fans of the dressy movies or the romantic fan fiction, while others prefer the sexed-up send-ups and the mysteries. They include mischief-makers and members of the Jane Austen Society, bloggers and buyers of Jane-related dolls and coffee mugs, note-cards and refrigerator magnets. Writing Why Jane Austen?, I was astonished and fascinated by the range of Austen movies, spin-offs, products, and devotees—and the enormous changes in those over the last twenty years and more. A Janeite today is sometimes exclusively interested in Austen and her novels, but she (usually) is often also involved in the culture that has grown up around them. She revels in being a member of a club, exchanging thoughts and feelings about matters more or less related to Jane and pooling thoughts and feelings with those of other Janeites. Janeites tend to support one another, also to seek converts. The Janeite likes to mix it up—characters in the novels and Austen friends and family members, and people who have written about Jane Austen all tend to slide together in a blog post or a story or a conversation. Slippage is part of the pleasure and the point: when you tell her that the woman you met on the train reminds you of Mrs. Jennings, a sister Janeite will know the kind of person you mean: affinity, complicity is the point and the pleasure. In Why Jane Austen?, I write about Jane Austen’s family’s neighbors and also a bit about mine. Blurring the line between actual and imaginary worlds seems to have been fun for Jane Austen herself. She read her stories aloud to friends, looked for portraits of her characters at art exhibitions, even speculated about their afterlives. The reader who gets her tone feels as if she is in league with a friend. Reading Jane Austen—still accessible, miraculously, after all these years—you feel invited to agree with the author about the people she reads so well; feeling (as Katherine Mansfield put it) like a secret friend of the author, you seek out her other friends, and join together with them in an Austen club. It’s an unusually social result of a solitary practice. 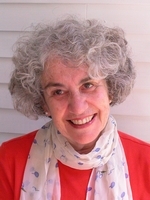 Rachel M. Brownstein is professor of English at Brooklyn College and the CUNY Graduate Center. A graduate of Hunter College High School and Barnard College, she received her Ph.D. from Yale University. She is the author of two critically acclaimed books, Becoming a Heroine: Reading about Women in Novels and Tragic Muse: Rachel of the Comédie-Française, as well as many articles and reviews. She lives in New York City and enjoys summers in Vermont. For many years she has talked and written about Jane Austen’s novels, critics, characters, imitators, adapters, admirers, and wannabes. Visit Rachel at her website Rachel M. Brownstein, at Facebook, or at Columbia University Press. Giveaway of Why Jane Austen? Enter a chance to win one of two copies of Why Jane Austen? by leaving a comment answering what intrigues you about this new lit/cultural history of Jane Austen or why you are a Janeite, by midnight PT, Wednesday, July 13, 2011. Winners to be announced on Thursday, July 14, 2010. Shipment to US addresses only. Good luck! Thanks for the great guest post and giveaway! I’m always intrigued by how people take classic literature and twist it around, whether Jane Austen’s or another author’s. I’m also highly interested by history, literature, and anthropology in general, so “a literary and cultural history” book is right up my alley. Absolutely. I never understood what Elinor saw in the feckless Edward Ferrars, and the first time I read S&S, I fully expected Elinor and Col. Brandon to wake up and smell the coffee and realise they were made for each other. I perceive I’m not alone. Why am a Janeite? Not sure except that I really love her books! They make me happy. i love her books and i admit fantasy plays a big part in this! I’m a Janeite because I can keep rereading her books and they never grow stale. I also agree w/Susan D. above re: Elinor. Such a delightful post. Although I love this and other blogs devoted to Jane, and I follow and read them daily with great interest, I don’t feel I’m qualified to call myself a Janeite, because I’ve yet to read all of her novels. I’ve watched the movies, even different versions of the same story. I’ve become familiar with lots of the characters through the movies and through these wonderful blogs. I love the regency period; I love Jane Austen’s wonderful characters; I’m planning to read all the novels. Maybe I’m a junior Janeite. What intrigues me about the new lit/cultural history of Jane Austen is that I think the more we learn about Jane we get a greater insite to her characters and her wit! I’m a Janeite because I love everything Jane Austen, Regency, her novels, and most of the what-ifs, variations, and moderns that I read. I am a Janeite because I fell in love with Jane’s way with words. Each character is well defined by what they say. No need for exhaustive, descriptive paragraphs about each character, we know who they are by their turn of phrase. She draws us in to the homes and the towns so well that we want to live where she has her characters living. As with people in all neighborhoods and families there are some we love without question and others not so much. I would love to have a copy of this book to understand even more deeply into why Jane Austen is so important to me. Because of my love of all things Jane Austen, I would love to win this giveaway. What intrigues me about this new lit/cultural history is finding out details, etc about Austen and why people like me love her work. I’m a Janeite because I love her snarky humor and social commentary, the way she hits a characterization spot on in just a few sentences. I enjoy the Regency period in general, which means I’m also a Heyer fan. I love learning more about the era. I’m curious to see how Janeitism has changed over the years, and yes, why I have been sucked into the paraliterature and fiction about Jane Austen. I feel that I am a Janeite because she never ever gets old. No matter if the story is hers, about her, a continuation of her work, or even movies based on any of the above, I could immerse myself in it forever. Picking up Pride and Prejudice or Persuasion feels like coming home. Kristen K – if you’re not a professional writer, you should be. Your comment is lovely. And thank you, Rachel Brownstein, for all the work that went into a fine book. I’m not entering the giveaway, because I’m already reading it! I would love to read this book! Why am I a Janeite? I guess I am a Janeite because I love all things Jane Austen. “…….A Janeite today is sometimes exclusively interested in Austen and her novels, but she (usually)……” Don’t forget about the fellowship of the unashamed: Men that also love Jane Austen! From a guy that seldom ever read or viewed anything TWICE, I have read ALL of Miss Austen’s works multiple times. Jane Austen has opened up an entire new world of fascinating historicity for me. I’ve also read a couple of offerings on the Jane Austen phenomen but I crave more. No, I don’t understand it quite but there is such joy and pleasure in trying to figure it out and I’ll bet your book will go a long way in that regard. Here’s what I find intriguing: why so often discussions that begin by confirming that Jane Austen is intriguing turn into discussions about why Jane Austen is so intriguing. Her works’ amazingly unassailable popularity, yes, but other writers produced works that are similarly wildly popular decades, even centuries, after their deaths. Shakespeare comes to mind obviously (but then his popularity is perhaps too universal or at least universally acknowledged). The ideas of slippage and a type of club whose membership rests on knowledge of the books and their writer’s life is the best approach I’ve seen to answering this question. My years in college predated the Austen boom. I had a double major, Math and English. The literature courses I took ran the gamut from Chaucer (in the original Middle-English) to 20th century works — one day, on my own, I read “Pride and Prejudice” and was astonished at how refreshingly readable it was, even more so than Dickens (who had been, up to then, my favorite 19th century author). That’s when I became a Janeite. Oh, this sounds delightful! I’m a Janeite for many reasons, but mainly because she wrote stories that are still entertaining hundreds of years later. Her characters are captivating, and I’m always surprised by how funny her novels are. For me, it’s impossible not to be a Janeite — our Jane is inspiring, witty and accessible, and I adore seeing the many manifestations of her stories and characters alive and well through current fiction. Such fun! This book intrigues me because it’s a question I myself have wrestled with. Why Jane? I know that when I read her books, it’s literary comfort food, and there is nothing like connecting with someone who loves her as much as I do, just as Ms. Brownstein describes. I have this book on my wish list in Amazon, I’d love a chance to win. I am a Janeite for many reasons. I grew up reading her novels, I studied her works in college, she is possibly the best author I have ever read, I have romanticized (just a bit) her time period, and there are many more reasons that I cannot put into words. This sounds great. I’ve often wondered why? I suppose Hollywood has helped. The other is because Jane is a woman and can be compared to Shakespeare in the depth of her characters and their relationships. I got into Jane Austen because of where I was born. Oh no!!!!!! NOT old “bobble head,” again!!! I thought we got that out of our system. ha! ha! I think Janeites should be anyone who loves any aspect of Jane Austen: the plots, the characters, movies, bobble heads, etc. It’s all fantastic! What a lovely sounding book! (And it certainly wins the prize for best cover in my opinion.) I’ve never used the term Janeite to describe myself, but I suppose I am. I’ve read all the novels and the minor work, seen nearly all of the adaptions, and actively research the time period. But what I feels really makes me a Janeite is that I have a Jane Austen action figure, just the like cover! I found Jane Austen because I developed a serious illness that required me to rest. A friend decided that I was a Janeite in the making. I thought she was a writer that I “should” read but didn’t want to. Then Colin Firth walked onto the screen when she showed me the 1995 Pride and Prejudice. I was enchanted and set about reading all of her novels. Now I research the period, read most of the sequels, read many of the blogs, and joined JASNA. Jane Austen has captured my imagination and roused my intellect in the ensuing years of dealing with the illness. I really want to read this book. lovely addition to Jane’s retinue ! looking forward to a solid read … thx! I’m a Janeite because her books intrigue me–I always wonder why she wrote such happy endings, and yet she herself never married. I love the characters, because they seem so real, yet they have the happy endings that don’t always happen in real life! I adore Jane Austen’s books! I’m a new ‘janeite’ as I’ve found I just LOVE her novels…I’d love to win this and continue on my love of reading her books as well as others about her. This book sounds wonderful! I can’t wait to read it! Why am I a Janeite? Well I LOVE her novels, the characters and the storylines! I am in awe of the fact that the stories she wrote over 200 years ago are still having such a huge impact on people today…like me!! I just love all things Jane!! I am currently writing a new Jane Austen-inspired novel, and this book would be such a wonderful addition to my research. I’m sure that I would glean many invaluable insights that would find their way into my book, and it would be a treasured addition to my Austen library. I can’t wait to read it! Thank you for holding this contest, Happy July 4th, and Happy Moving Week! Oh Marybeth, is that right??? I love Ms. Austen’s books. I feel connected to her characters. Not in the “I live in impoverished gentry fashion”, but that I feel like her characters. I like to suppose that if I were faced with similar circumstances that I would behave with decorum and honorable character. I feel like anyone who can read her novels over and over and over again (you get my point), should be considered a Janeite. I am overjoyed every time I turn the page. Her writing remains as fresh today as when she put pen to paper 200 years ago. We are blessed to be able to enjoy her prose and to pass that love on to the next generation. I am intrigued by anything that has to do with Jane Austen. She is just such a fascinating character that I can’t get enough of her. I know I’m a Janeite because I swoon over rakish men, I love a good cup of tea, and a brisk walk will always clear up my malaise. Sounds like a fun, interesting read about my own particular tribe. Would love to win a copy of this book and sharing and discussing it with fellow enthusiasts. The funny thing is that I can’t even exactly pinpoint the one reason why I am a Janeite. I love so many things about her, about her books, about her world. It all started when I was an insecure girl of fifteen who loved to hide in books. I started out as an insecure Catherine Morland, or maybe even a Fanny Price or Mary Bennet, who would love nothing so much as to be a real Elizabeth Bennet, or Emma Woodhouse. When I got a little bit older and started university last year, majoring in literary studies, I came to love Miss Austen’s wit and biting sense of irony in Emma and Northanger Abbey , and was I finally able to fully appreciate Anne Elliot. As I grow older and more mature, I keep discovering new things in Miss Austen’s novels. I knew, even before I started at university, that I wanted my thesis to be about why people love Jane Austen and in how many different ways it is possible to be in love with her novels. It seems this book is exactly about that! Being a Janeite has made me meet a lot of new friends whom I love very dearly. Two years ago there were only 20 of us, and now there is a complete Jane Austen Society in The Netherlands, something which I never dreamt would happen. Being a Janeite has given me so much. I am a Janeite because I think she wrote some of the most beautiful books ever written. Why I am a Janeite…I just love so many things about Jane Austen and the time period she lived in. I also love her books because it reflects daily life back then, relationships that any one can relate to and feelings/emotions that one can attest to. Why am I a Janeite…hmm. I guess because I find her take on love to be timeless. And I am fascinated with how people lived back then. If I could go back in time, I’d love to spend a day walking in Jane’s footsteps. Oh, and anything that has romance, England, gorgeous scenery and beautiful dresses appeals to my girly side. I am a Janeite because I never get tired of reading Jane Austen novels. (Nor do I tire of watching the “Pride & Prejudice” film; Colin Furth will always be Mr. Darcy.) The characters in Jane’s stories are still relevant. I mean, really, what woman would not to be smart, witty, beautiful, and true like Elizabeth Bennet? Jane Austen will hold the same appeal for another 200 years! What an intriguing read this should be! Sounds so interesting and fun. I guess I am a Janeite because I love all things Jane Austen, her books are timeless, and I could watch the film versions over and over!